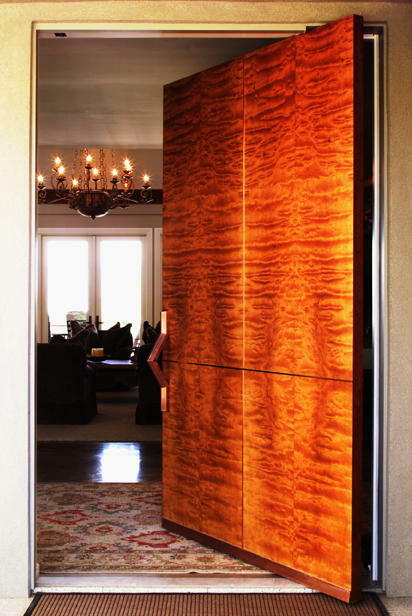 This is a 44"x96"x2" pivot-mounted, highly figured African Makore front door that is inlayed with copper, which actually sits proud of the door surface by approximately 1/8 inch. The door faces are identical on both sides and it has a natural finish. We book and balance the veneer; then end match all eight pieces at the point where the door handle will center to create the look we are after. I think the layout worked out really well! We also decided to call the figure Pommelle Drape, because it's a combination of the two and it sounds good. This door graces the entry of a beautiful home in Boise,Idaho.